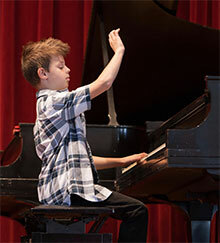 Solo performances at recitals develop students' ability to perform in front of an audience, developing the confidence to present and stand independently. Students feel good about their achieved accomplishments. 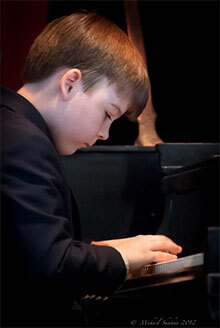 Each student gets an individualized plan and is encouraged to do more than the minimum to develop personal excellence. Lessons and Recitals are well structured to teach seemly behavior, boundaries and develop strict adherence to rules & order. One facet of the lessons teaches students to identify problem areas and explore solutions. Customized practice planners with quantization values guide the student to plan, prioritize and time manage their practice each week. These tools will help students learn the importance of sacrifice. Specific daily goal assignments teach the student how to achieve larger weekly and annual goals through small steps. Students learn how to work effectively and efficiently toward achieving the best and productive results. Live performances, "how to" lessons, and a specialized music reading program require tangible and intangible mental processing, which develop analytical thinking skills. Lessons are structured and organized with attention to detail that stimulate the left brain. Additionally, students use the right brain while learning with specialized multi-sensory teaching aids. Detail work helps the student to develop a focused attention. It takes more than just knowledge to build a piece to performance level. Specific repetition assignments for muscle memory develop physical endurance and mental patience. 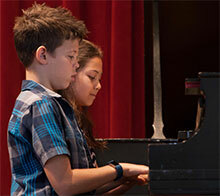 Parental involvement and duet performances develop cooperative effort and teamwork skills. Students learn the meaning of commitment, especially when it involves more than them.